I’m currently trying to use the UpdateGraphsNoBlock function but am encountering difficulty. 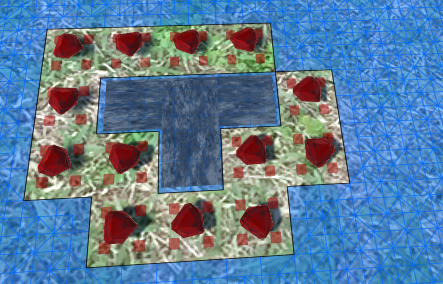 Can anyone tell me how to set up A*pathfinding to calculate blocked paths in this way? How is your allPathNodes list defined? Can you verify that if you set the Graph Coloring mode to ‘Areas’ then the inside of that region should have a different color than the outside (right now when using the ‘Solid Color’ mode they are both blue). Also can you verify that one of your checkpoints is inside that region? This first screenshot the region inside the circle of gems is counted as unreachable and I cannot place a gem in the top right corner, however in this second screenshot that is not the case. In this the region looks like a very slightly different color but It still calculated as reachable when I place a new gem and detect if its blocking the path. 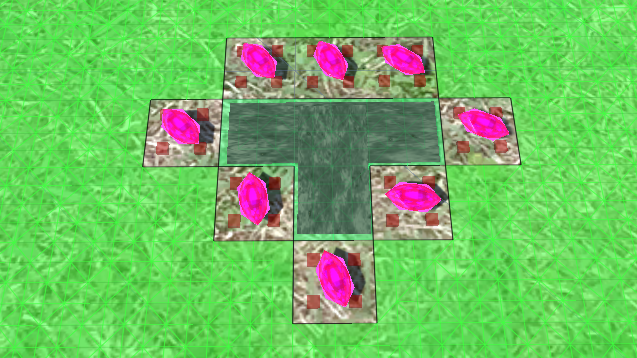 (Intended functionality is to destroy the gem, essentially preventing the placement. Any ideas as to how to get around this problem? That is strange. I cannot see why it wouldn’t work in the second case as well. Do you think it would be possible for you to share a small test scene that I could use to replicate this issue? I’ll work on trying to put a sample scene together over the weekend. though I haven’t done that before.